Eight is considered a lucky number in Chinese culture. Will this eighth version of Pro Tools bring prosperity to Digidesign, as they try to establish their world‑leading recording and mixing application as a serious contender in the music‑creation market? 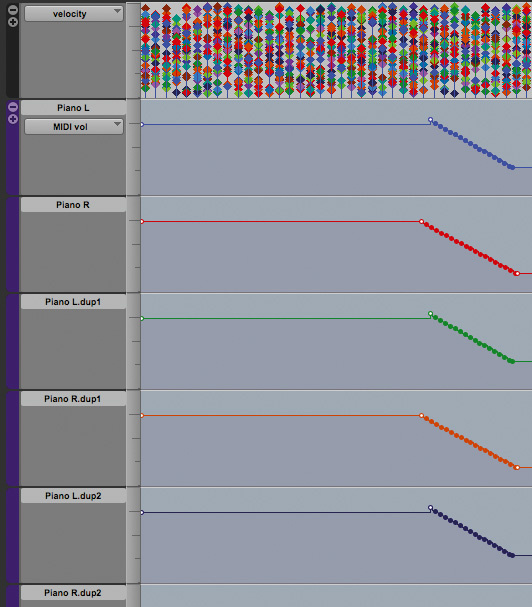 For years, Digidesign have been doing almost exactly the opposite to most other companies in the music industry: namely, trying to turn an audio application into a sequencer. And while Pro Tools 7 and its point‑one incremental successors finally got the company's flagship product into a position where sequencing was a bit like cutting steak with a butter knife (you could do it, but it probably wouldn't be much fun), Pro Tools 8 has a clear mission: to make Digidesign a serious contender in the music‑creation market. Given that Pro Tools 8 is such a significant update in terms of its scope and new features, this review will consist of two parts, with the first focusing mostly on the new user interface and MIDI editing capabilities. I should also note that unless otherwise stated, all references to Pro Tools 8 refer to all versions of the software: HD, LE and M‑Powered. Pro Tools' new Quick Start window appears when you start the application and offers easy access to the most common tasks you would want to perform when starting a Session. As seems to be the trend these days, the first thing you'll see after starting Pro Tools 8 — aside from a flashy new splash screen — is the Quick Start window. This provides immediate access to the two most common tasks you'll need when starting to work: creating a new Session, and opening an existing one. In addition to being able to start a new, blank Session (where you can set the usual initial audio and I/O configuration from the handy Session Parameters section) you can also create a new Session from a selection of Session Templates. The included templates offer useful starting points for a number of different situations, and are organised into categories such as Guitar, Music and Songwriter, and the Guitar templates also include 'Lower CPU Usage' versions, where fewer plug‑ins are used. 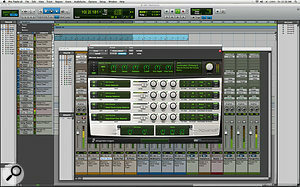 For those who start Sessions from a more technical perspective, the Record+Mix category offers more generic templates such as '24+EQ+Dyn+FX Returns', giving you a ready‑made 24‑track mixer with EQ and dynamic inserts on every track, along with assigned sends to three aux input tracks set up for reverb, chorus and delay effects, and a headphone bus. A nice touch is that these templates make use of the ability to add comments to tracks, giving helpful directions as to how the Session's mixer is configured. While seasoned pros probably won't have much use for the included templates, beginners may find them helpful, if only just to see what's possible from a workflow perspective. And it's possible to create your own templates by saving a Session with the 'Save As Template' command. Although the Quick Start window is useful, and more friendly than the blank screen and menu bar that greeted users of older versions, it can be disabled, which is great if you prefer to open Pro Tools and press the key command to open the most recent Session instead. Once you have a Session open, you'll see that Digidesign have significantly changed the application's user interface, opting for the 'dark is the new light' colour scheme preferred in so many professional software products. Digidesign claim this new colour scheme is easier on the eyes when working for long periods. I'm sure that's little comfort to engineers who still have to actually stay up late and work but, joking aside, the new design is definitely more aesthetically pleasing than the last significant change to Pro Tools' appearance in version 6. But it's not just the colour scheme that's changed; Digidesign have given Pro Tools a fresh, modern, and slightly flatter appearance, with redesigned icons and an updated visual vocabulary. The Edit window, in particular, has spruced up nicely, and although its basic layout remains largely the same, there's obviously been a great deal of polishing to make things clearer and easier for users. For example, the toolbar immediately stands out as looking different, but also offers many functional improvements (see 'Tools In The Bar' box) while keeping the same basic operation, and this ethos applies to most parts of the redesign. An Edit window menu, accessible from a button at the top right of the toolbar, allows you to configure the various elements that can be made visible: as before, you can hide and show the Track and Region Lists, but the Universe view has also been incorporated as an optional part of the Edit window. I think this is a great idea, and I doubt anyone will miss having the Universe, if you'll excuse the expression, in a separate window. The Rulers area has also been improved, and the entire length of whichever ruler is the Primary Counter is now highlighted, making it much more readable on a larger display. However, not every visual change to the rulers is so useful. Many of the ruler colours have unhelpfully changed from Pro Tools 7, with the Meter ruler becoming blue instead of green, and the Marker ruler grey instead of blue, for example. They have also become quite dark, and as such, less readable when working with the expanded views. The Track List, on the other hand, is better in every respect. Again, it's visually clearer, and highlights one of the main improvements that applies throughout Pro Tools 8: how much more readable text has become with proper anti‑aliasing. Staying with the theme of clarity, the separation between tracks in the list has become much more distinct, thanks to the fact that the track's colour strip has round corners and the contrast between the Track List's background and the track's foreground is more pronounced. 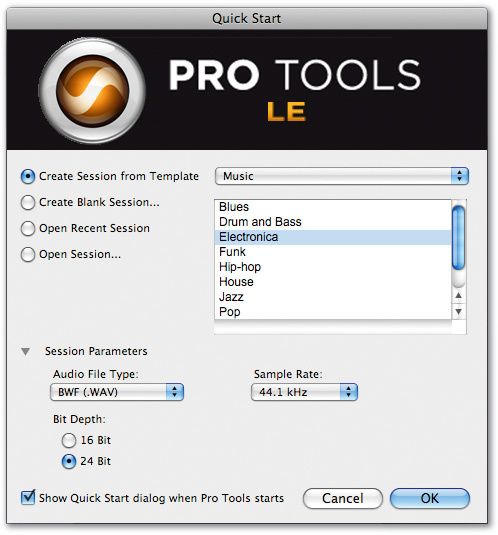 Perhaps the feature that will have Pro Tools users dancing in the street, however, is that rather than only being able to see and edit a single type of data on a track at a time, tracks in the Edit window now offer automation lanes, making it possible to work with multiple automation parameters — and even playlists — simultaneously. This capability is implemented in a similar way to many competing products, with a new Show/Hide Automation Lane(s) button at the bottom of each track's colour strip. Clicking this reveals or conceals automation lanes beneath that particular track. These work in exactly the same way as editing automation events on the track lane itself — which you can still do, of course — and each automation lane you add offers a button for adding another. One particularly curious undocumented feature that arrived in Pro Tools 7.3 was the ability for a track's background on both the Edit and Mix windows to become infused with the assigned colour. This was achieved by holding down some awkward key combination, while dragging the mouse to adjust the saturation level of the colouring in the Colour Palette window. Engineer friends loved the pragmatic way it made the screen clearer (particularly if you used the default behaviour of using colour to indicate different track types), but I always found the solution aesthetically clumsy. Thankfully, in Pro Tools 8 this hidden ability has become more accessible, and the Colour Palette window now offers a Saturation slider (as well as a more general brightness slider, which is useful if you prefer the lighter look of Pro Tools 7) to adjust the amount of a track's colour that should be applied to its background in the Edit and Mix windows. Not only is it easier to apply the colour, but it looks much better too, especially on the Mix window. And speaking of the Mix window, this has also been redesigned, although the functionality remains pretty much the same, which is no bad thing. One slight improvement to the mixer architecture that those working on large mixers will be particularly happy about, though, is that you can now have up to 10 inserts per channel, by displaying a second bank of five inserts as you could previously do with sends. Initially, I didn't really like the look of the new Mix window, especially with the circular pan controls for stereo panning, but it grew on me as I worked with the application. 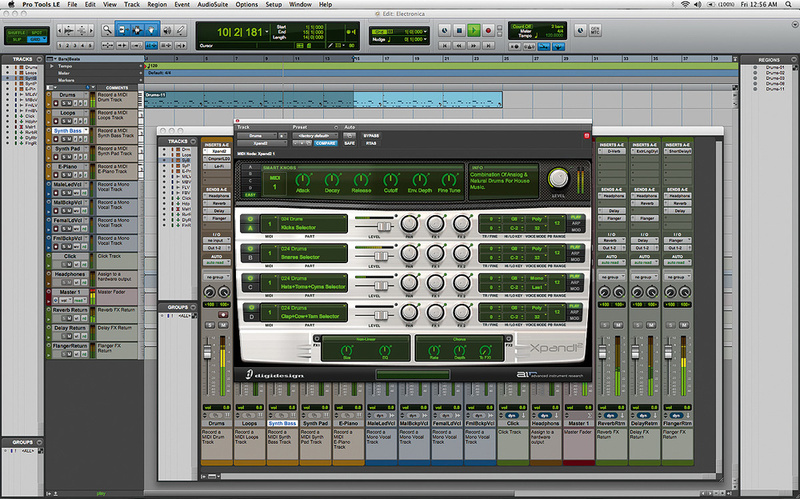 Overall, the new user interface is definitely welcome in Pro Tools 8. It's pleasant to look at, and, more importantly, offers better contrast and clarity when compared to previous versions. Existing users will need a few moments to reorient themselves, but on the whole I think both these users and newcomers alike will consider the new interface an improvement. I do have a couple of minor criticisms, though. Firstly, I really don't like the dark nature of the scroll bars, which results in a 'dark grey against light grey' appearance. It definitely isn't as clear as it used to be, and I think this is especially noticeable for Mac users: previous versions of Pro Tools used OS X's bright‑blue scroll bars that stand out so well. Secondly, and of much less concern, it does seem a shame that some parts of the application got left behind in the streamlining process of the new user interface. While all of the main areas of working with a Session are covered, most of the configuration windows still have the old, somewhat‑like‑the‑host‑OS look to them, such as the Preferences, Peripherals and I/O Setup windows, or even simple things like the track naming window. I know it's picky, but a new Preferences window that helps you find obscure options you know are in there somewhere (much like Leopard's System Preferences window) would really be nice. And I do think extending the new visual appearance to all windows would help keep you in the 'I'm using Pro Tools' mindset, without being reminded of the past. In order to make life easier for newcomers, Pro Tools 8 comes with a variety of templates to give you a starting point for your own productions. Here is the Electronica template, which comes with a ready‑made drum track played by the new Xpand!2 instrument. While a new user interface might be considered a significant enough reason to promote a major new version of a software product, there's another feature in Pro Tools 8 that is perhaps as — if not more — significant: the MIDI Editor window. 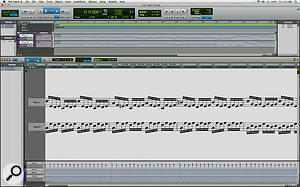 The ability to edit MIDI data has been part of Pro Tools since version 5 was introduced nearly 10 years ago, and although Digidesign have been steadily refining this ability over the years, Pro Tools 8 marks the first time you can graphically edit MIDI data outside the confines of a track lane in the Edit window. And not only can you open the MIDI Editor in a window, but it can also be integrated into the Edit window, for those users who prefer the single‑window editing experience. Acclimatising oneself to working with the MIDI Editor window takes a few moments, partly because, until now, there have only been two windows to deal with — the Mix and Edit windows — and these could easily be exchanged by pressing Command/Ctrl and the '=' key. The MIDI Editor window is opened by either double‑clicking a MIDI Region (which is the default behaviour for double‑clicking a MIDI Region in Pro Tools 8, and, as in most sequencers, can be changed to perform other actions) or pressing Ctrl/Windows and the '=' key. Exisiting Pro Tools users will find the keyboard shortcut operation a little odd to begin with, since pressing the shortcut key again with a MIDI Editor window in focus does nothing. If you use the original Command/Control '=' shortcut, will it be the Edit or the Mix window that appears? Fortunately, the behaviour is quite sensible. If the Edit window was open when you opened the MIDI Editor, the Edit window will reappear when you press Command/Control '=', and the same is true if it was the Mix window that was open first. If you've used piano‑roll‑style editor windows in other sequencers, Pro Tools 8's MIDI Editor window should feel quite familiar, and the basic editing workflow follows the same conventions as for editing MIDI data on a track in the Edit window. The big advantage of the MIDI Editor window, though, is that not only can you edit the MIDI data for a track in a dedicated window (without disturbing your main Edit window), but you can view the notes from multiple MIDI tracks superimposed on each other, making it far easier to see harmonic relationships between notes on different tracks. The MIDI Editor window offers the ability to display the Track List (incorporating the Group List) from the Edit window, so you can toggle any track in the Session to be displayed without having to leave the MIDI Editor window. What's great about this is that you can quickly hide or show a track without disturbing the view of the MIDI Editor, such as the zoom or position, and this saves your concentration from being distracted if you quickly want to check a note in another track. 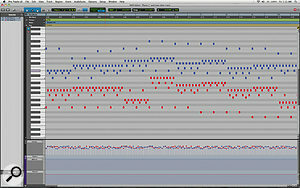 One thing to bear in mind is that Pro Tools' MIDI editing approach remains very much track‑based. Like the existing MIDI Event List window, the MIDI Editor window always shows all notes for the currently active track, even if you opened the MIDI Editor window by double‑clicking just a single Region. However, on the plus side, if you only have a single track displayed in the MIDI Editor window, it will display the Region boundaries in the background. An important concept when working with the MIDI editor windows is Target mode. If you're familiar with the idea of window‑linking in other applications, Target mode is pretty much the same idea in Pro Tools, and is based on the way plug‑in windows have worked in the past, where a single targeted plug‑in window will always display the currently selected plug‑in. If a MIDI Editor window has Target mode enabled, a selection in the Edit window will be reflected in the MIDI Editor window, although only one MIDI Editor window (including an integrated instance in the Edit window) can have Target mode enabled. The MIDI Event List window now also sports a Target mode button, which can still be enabled even if a MIDI Editor window also has Target active, and when enabled it reflects the current selection in the Edit or MIDI Editor window. Editing in the MIDI Editor window is quite simple, and, as with the main Edit window, you have access to a number of tools on the toolbar, although the Smart Tool is probably the only one you'll need most of the time. As in the Edit window, the function performed by the Smart Tool varies depending on which part of the note the cursor is hovering over. If the cursor is towards the front or back of the note, you can stretch the note forward or backwards, while dragging the middle of the note allows you to transpose the note vertically or move it horizontally in time. Holding down the Ctrl/Windows key gives you access to the Free Hand Pencil tool when editing MIDI data, providing an easy way to add notes. Alternatively, you can double‑click where you want a note to be created, or double‑click an existing note to delete it, which is quite convenient for the odd edit, but would probably give you repetitive strain injury if you used this approach too much! One quite nice feature that was already in Pro Tools, which I must confess that I've failed to notice before, is that the other modes of the Pencil tool are also useful when adding notes. For example, the Line tool allows you to draw a line of repeated notes of the selected insert duration, and the other Pencil variations all use their shapes to adjust the velocity shape of the notes that get added. Currently, these notes are all the same pitch, and dragging up and down while drawing adjusts the pitch of all the notes being added. It would be great to have a modifier or something that allowed you to define a start and an end point for the line, though, as it would be a fun way to program a glissando! Notes are coloured in the colour of the Region to which they belong by default, with the intensity of the colour reflecting velocity. The MIDI Editor window also offers options for colouring only by track or velocity. Colouring by track uses different colours from those assigned to the actual track (which can be confusing, although it can also help to distinguish notes from tracks that share similar colours), and colouring by velocity makes all notes a shade of red, no matter what tracks are being displayed, with the intensity based on each note's velocity. The Pro Tools MIDI Editor window also offers the ability to show additional lanes, allowing you to see and edit velocity, MIDI controllers, and even automation data. This last means you can manipulate automatable parameters in instrument plug‑ins that aren't accessible by MIDI controllers, without leaving the MIDI Editor. However, I think there is a slight flaw in the way the velocity and controller lanes work that could make the MIDI Editor quite useless to certain users. The MIDI Editor window finally gives Pro Tools the ability to edit multiple MIDI tracks simultaneously in one graphical window, complete with velocity, controller and automation lanes.Firstly, the velocity lane superimposes the velocities for the notes of all tracks that are visible in the editor on top of each other, which can make the velocity lane almost impossible to handle if you have a large number of tracks open. Secondly, with controller lanes, if you add a lane to display volume, for example, you'll get a separate volume lane for every track open in the editor, listed in the same order as the Track List. This might not sound like a big deal, but if you want to open the four tracks comprising a string quartet and also work with velocity, volume and expression at the same time, you'll end up with nine lanes, which takes up quite a large part of the editor window! I'm really not sure why you would ever want to see controller lanes for multiple tracks at the same time; for one thing, you end up with simply too much data on the screen, and also, you may end up having to scroll around to find the controller lane that corresponds to the track you want to edit. But even if there's a situation I'm overlooking where this behaviour would be useful, I feel there should at least be a preference to allow velocity and controller lanes to exist only to show data for the track selected for editing. Another slightly quirky feature in the MIDI Editor window is that there's another set of Mute and Solo buttons on the toolbar, making it possible to mute and solo the tracks currently displayed in the window, although this works slightly differently to the approach adopted by some other sequencers. Rather than being independent editor solo and mute commands, which are only active when the MIDI Editor window has focus, these buttons actually mute or solo the relevant tracks on the mixer. This is all right, but it's a real pain sometimes when you solo or mute a number of tracks in the editor, close the window before disabling these buttons, and now have to find those tracks again to disable the solo mode. A 'disable editor solo/mute on closing window' preference would be handy, as would some kind of solo/mute indicator in the MIDI Editor window's Track List. For an application that's only just getting a dedicated MIDI editor window, it's particularly commendable that Digidesign have also included the ability for it to display notation — and not just any old notation. 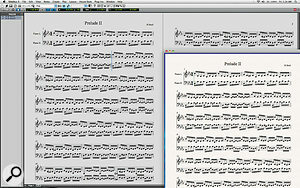 Given that Digidesign are a sibling company of Sibelius, the developers of the eponymous score‑writing software that's generally regarded as being the finest available, Pro Tools makes use of the same Opus music fonts used by Sibelius, meaning that the quality of notation displayed in Pro Tools is very high indeed. However, it's not the case that Digidesign have simply put Sibelius into Pro Tools. There are definitely some clear similarities, such as the way ghosted notes appear on a staff to indicate where the mouse is hovering, the way the notes turn blue when selected (as they do for the first polyphonic voice in Sibelius), and the way the play cursor moves across the page. 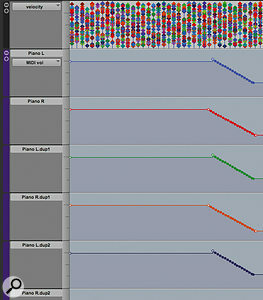 But many of the editing paradigms have more in common with scoring features traditionally found in other sequencers, such as the way each staff has, in Pro Tools‑speak, Notation Display Track Settings, where the display transposition and quantise adjustments are made, the clef can be chosen, and also split points for piano‑style treble and bass clefs. 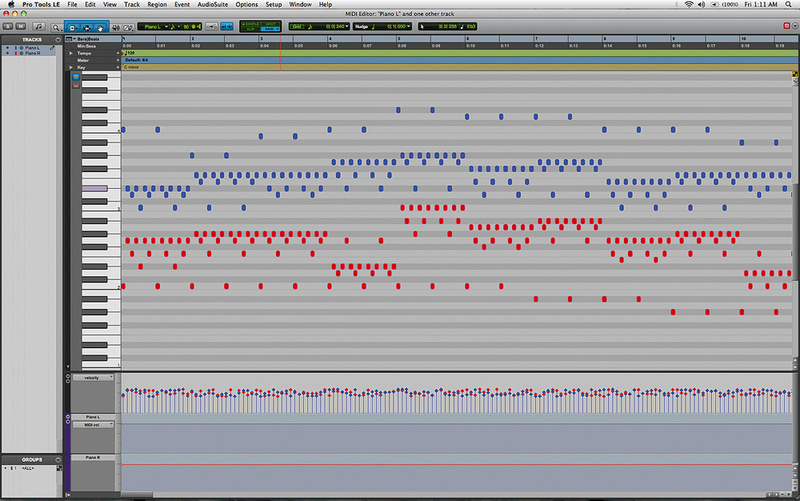 It might resemble something the artist John Maeda might create, but the MIDI Editor window's velocity window lane can look like this when displaying multiple tracks at the same time. Note also that each track being viewed will have a separate lane for any type of controller data you want to manipulate. Have 40 tracks in the editor and want to use a volume controller lane? That's 40 volume controller lane tracks you'll be juggling in the editor.When you're working in the MIDI Editor, you can switch to editing the notes as notation by simply enabling the Notation Display button on the editor's toolbar. This gives you a linear view of the score, where the notes run from left to right (as indeed they did in the piano‑roll‑style view), and the nice thing about this view is that it keeps any rulers or lanes you might be displaying in line with the notation. If you're displaying more than one track in the MIDI Editor, Notation View displays each track on its own staff, clearly labelled so that you know exactly what staff corresponds to which track. Given that the MIDI Editor is track‑based, you could end up seeing quite a number of empty bars if the Notation View displayed a score that represented the entire length of a Session. So to deal with this, there's a handy preference that lets you set how many empty bars are displayed in Notation View after the end of the last Region in the Session. This is set to eight bars by default, allowing you to add notes into an empty spot on a track up to eight bars after the last Region boundary. However, if you don't want to see these extra bars, there's a handy Double Bar mode, which, when enabled, places a double bar line at the end of the last Region in the Session. The amount of notation editing that can be carried out in Notation View is actually quite limited. 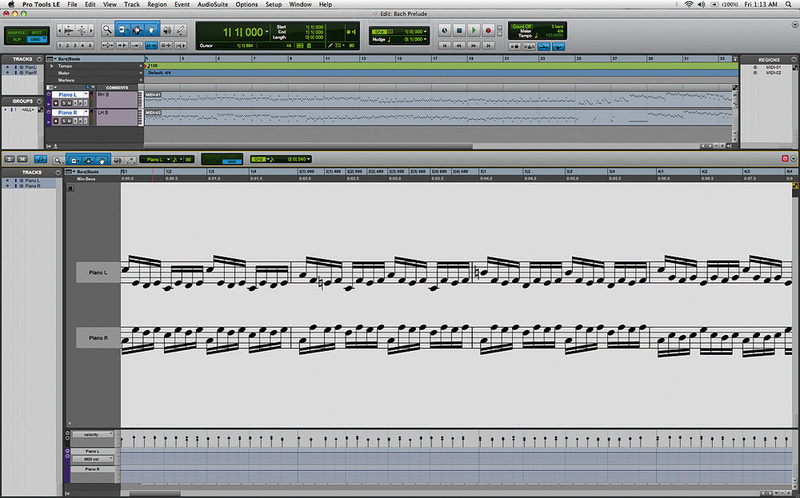 You can manipulate notes in exactly the same way you would on the piano‑roll, but that's about all. The only other score elements you can add are time and key‑signature changes, either via the Insert submenu in the editor's context menu, or by adding tempo and key changes in the usual way via Pro Tools' Rulers. Chords can also be added, but the symbols for these don't show up in Notation View, although you can see them on the Ruler. Not only is it possible for the MIDI Editor window to show notation, but the MIDI Editor itself can be integrated into Pro Tools' Edit window for the complete single‑window editing experience. One really curious aspect of how notation is implemented in Pro Tools is that there are two different windows that can be used for editing scores: as well as the notation view in the MIDI Editor window, described above, there's also a dedicated Score Editor window. 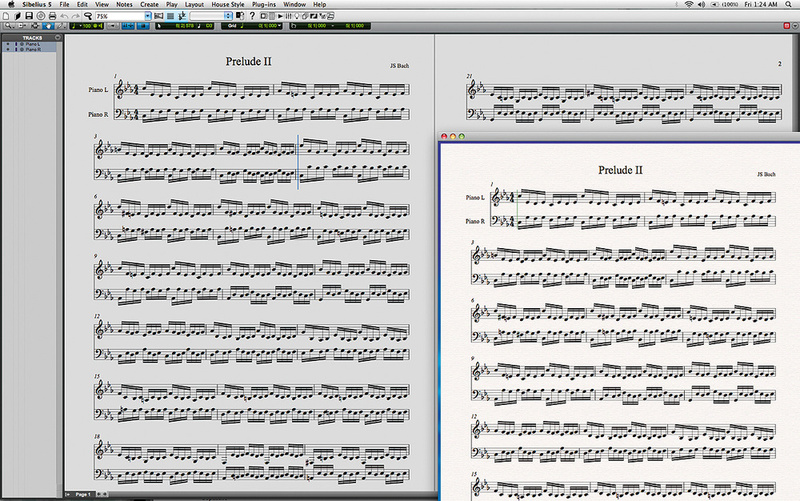 The primary difference between the two is that where the notation view in the MIDI Editor window displays each track's notation in a continuous, linear line (much like the Panorama mode introduced in Sibelius 5), the Score Editor shows how the notation will look on the printed page. In order to configure the final appearance of the score, there's an additional Score Setup window where you specify the size of the page, the title and composer of the piece, various spacing controls, and also set whether certain elements are included or not, such as page and bar numbers, and track names. You can also set whether chords placed on the Chord Ruler are added to the score, and optionally include appropriate diagrams of the chords for guitarists. While there are subtle differences between the MIDI and Score Editor windows, I'm not sure I see the reason why the MIDI Editor window's Notation View didn't just include a 'page' mode, or something similar. There would clearly be a good deal of baggage to carry over or hide in the MIDI Editor window when viewing notation as it will look on the page, such as the rulers; but equally, I could see the fact that you can use the two editors to achieve similar and yet different results confusing some users. For example, while both editors offer the Double Bar button, the MIDI Editor window puts it at the top left of the track labels (presumably so that it's only visible in Notation mode) while the Score Editor puts it on the toolbar. Maybe Digidesign feel that the Score Editor window would be more comfortable for Sibelius users coming to Pro Tools, as opposed to using the MIDI Editor window, but I'm not quite sure. In addition to the MIDI Editor window, Pro Tools 8 also includes a Score Editor window that shows you how the score will appear on the printed page. With Pro Tools 8's improved 'Send to Sibelius' feature, loading a Sibelius file created by Pro Tools into Sibelius gives you a pretty much identical score.Overall, though, despite their somewhat limited nature, the notation features in Pro Tools are a tremendous asset. While some users may ask why Digidesign worried about notation at all, there are so many times when, even if you're just recording audio, you might have a MIDI file in a Session for reference, and the ability to print out a quick part for a musician is incredibly handy. And I think this will only become more valuable if musicians start using Pro Tools as a sequencer, thanks to the improved MIDI editing functionality. Implementing a score editor could be a never‑ending task, and I think Digidesign were sensible to focus on the core functionality, making the quality of the display really nice. That said, there are a number of extra features that really would have been helpful, such as being able to insert clef changes at any point, or adjusting enharmonic spellings of pitches. And my slightly extended wish list would include the ability to include tempo symbols on the score, to be able to set the frequency of bar numbers, some kind of handling for polyphonic voices, a basic set of symbols to indicate articulations and basic dynamics, and being able to add additional text markings. Next month, we'll evaluate some of Pro Tools 8's more advanced capabilities, such as the new Satellite feature that lets you synchronise the transport of multiple Pro Tools systems via Ethernet, and the new track comping and playlist features. We'll also look more closely at the new collection of instruments and effects supplied with Pro Tools from Digidesign's Advanced Instrument Research (AIR) group. Much like Cubase and Nuendo, Pro Tools now enables you to configure what groups of controls are visible in the toolbar to complement the core edit controls, counters and grid values. Simply right‑click in the toolbar to toggle the inclusion of Zoom, Transport (along with an extended option for more controls), MIDI and Synchronisation groups. The Synchronisation group is particularly handy because in addition to putting a button on the toolbar (as before) to indicate and set whether Pro Tools' transport is on‑line, it includes buttons for toggling whether Pro Tools generates MTC or LTC (if you have a Digidesign Sync peripheral). These controls used to be in the Session Setup window, and it's a big improvement to have them visible in the Edit window (and, in fact, the Transport window). And speaking of visibility, I'm sure not to be the only one who finds the fact that the buttons for enabling modes like 'Tab to Transients' and 'Link Timeline and Edit Selection' are now much clearer than before. As well as setting what groups of controls are visible on the toolbar, you can also move the various groups around by Command/Ctrl‑dragging the desired group, even within the core set of toolbar controls. Personally I find this type of configuration slightly unnecessary: I'm not sure my use of Pro Tools has ever been hindered because of the location of the Edit mode controls, and I've always liked the fact that you couldn't really customise Pro Tools that much in previous versions, because it ensured a certain amount of consistency when working in different studios on different rigs. On the other hand, there is one situation where this behaviour is redeemable. Now you can include more controls on the toolbar, those with smaller monitors might get into trouble, as the Edit window simply truncates any toolbar controls it doesn't have horizontal space for, rather than intelligently thinning out the toolbar. So if you absolutely want to see the Synchronisation controls no matter what, it is possible to move them to the far left so they never disappear. But if your screen has around 1920 horizontal pixels, you can comfortably enable every toolbar option with room to spare, although Digidesign now have an easy paradigm for offering extra toolbar control groups in later versions. And, indeed, this paradigm of toolbar behaviour is consistent not just in the Edit window's toolbar, but also in the toolbars found in the MIDI and Score Editor windows.